"Is that seat for me?" asked Peggy. Skratch frowned. "It's for our readers, so that they can feel part of the action." I don't think they'll mind," laughed Lapinette. Peggy fluttered onto the spare seat and settled down. "What sort of Adventure were we just in?" she asked. "My goodness, you catch on quickly, Peggy," said Wabsworth. "Why don't you tell us?" meaowed Skratch. "Blow your whistle," added the Wabbit. "I will," trilled Peggy, "It presented a concrete intelligible space in which the spectator was created by the narrative." "Wow," said Wabsworth. Skratch shook his head. "You're thinking of Hitchcock, where form is quite indissoluble from content." Lapinette butted in. "Isn't cine-structuralism all discredited now?" 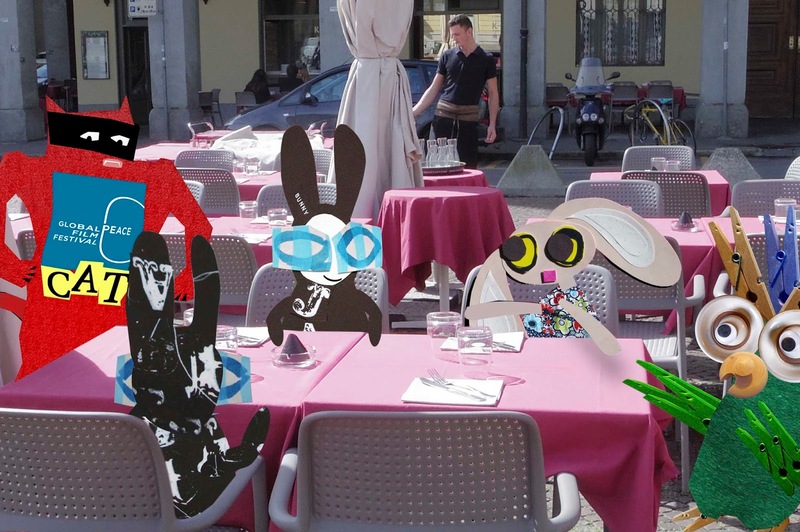 The Wabbit aimed a kick under the table, missed and spluttered that the development of theory had become as restricted as political discourse itself. "Things have gone down the hill," sighed Wabsworth. Skratch purred for a long time. "Perhaps we're the only creatures keeping theory alive." 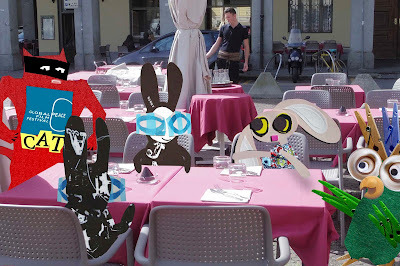 "That calls for a drink," said the Wabbit. He shouted to the waiter. "Please bring menus such that we theoretical heroes might subject them to a syntagmatic analysis." "Subito!" said the waiter, disappearing into the restaurant. "I think we're a hostage to our own hegemony," said Wabsworth. "You're right there, Wabsworth," sighed the Wabbit. Peggy fluttered her pegs. "Anyone like to buy a complete set of Cahiers du Cinema?" "How much?" yelled Skratch.